Heat 1 cup sugar in a dutch oven over medium heat until sugar starts to melt. Reduce heat to medium-medium low and constantly whisk sugar until it turns deep golden brown. Whisk in 1 1/4 cups heavy cream and butter, and contiue to whisk until well combined, sugar is dissolved, and deep golden brown in color. Remove pot from heat and whisk in salt and vanilla until combined. Pour caramel sauce in a large mixing bowl. Whisk eggs together in a large mixing bowl. In a large saucepan, over medium heat, whisk together remaining 1/4 cup sugar, 1 cup heavy cream and milk; bring mixture to a simmer, whisking frequently. Gradually whisk half of hot cream mixture into eggs until well combined. Whisk egg-cream mixture back into saucepan containing remaining cream. Cook, whisking constantly, until custard reaches 170 degrees F, or coats the back of a spoon. Whisk custard mixture into bowl with caramel sauce until well combined. Cover and chill overnight. Freeze caramel custard in an ice cream maker according to manufacturers' instructions. 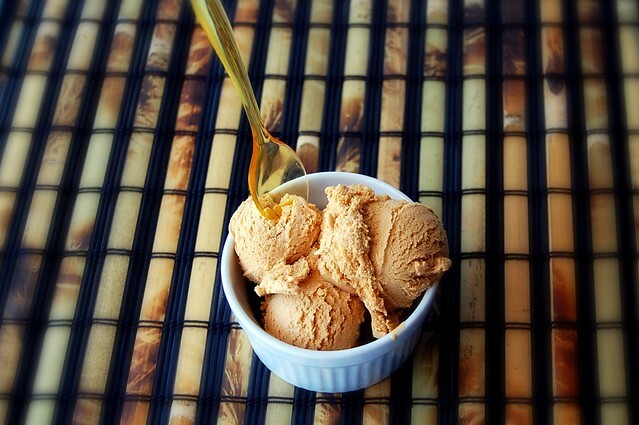 42 comments on "Salted Caramel Ice Cream"
I have always wanted to try salted caramel ice cream. I wasn't sure if the salt would interrupt the freezing or not. Evidently it doesn't? Beautiful photos! The photos are so pretty . . . it's like looking at an ice cream ad in a magazine. I could have practically licked the screen (and maybe I did). What a great treat! For those who loves caramel and ice cream, it's heaven! I love this flavor, and your take looks spectacular. Thanks for the inspiration! Gorgeous! 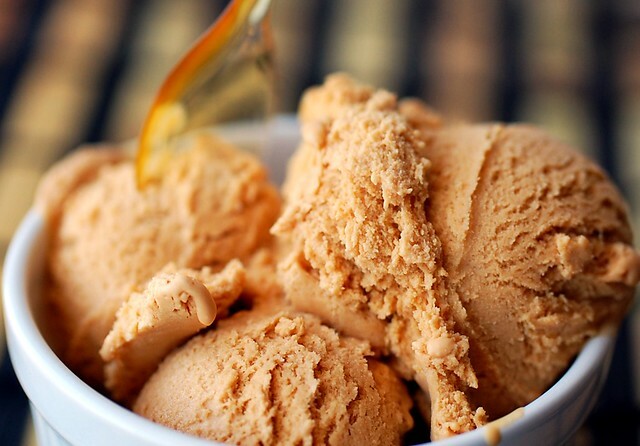 I've always wanted to try salted caramel ice cream... yum! I used to always gravitate towards maple walnut ice cream but salted caramel is now my ultimate when I can find it. I made one from Cooking Light and it was still delicious!!!! Homemeade ice cream is the best! We used to make it with the old hand-cranked ice cream machines, these electric ones are fantabulous! I can see mixing the salted caramel ice cream with chocolate ice cream or chocolate sauce into an amazing milkshake. It's -30 here and I'm thinking about milkshakes... this ice cream must be good! STOP RIGHT THERE. My favorite ice cream flavor ever. You rock. Yum! I'll bet this tasted sinful over the top of that chocolate cake! Great pictures, it looks perfect! I have an ice cream maker that has been sitting in my freezer, unused, for WAY too long. I think this salted caramel ice cream has it's name all over it! The salted caramel ice cream looks delicious! I'll take 3 scoops, please. We don't have an ice cream maker, but I may try and make it anyway - won't be a creamy as yours though, I am sure!! this looks amazing. 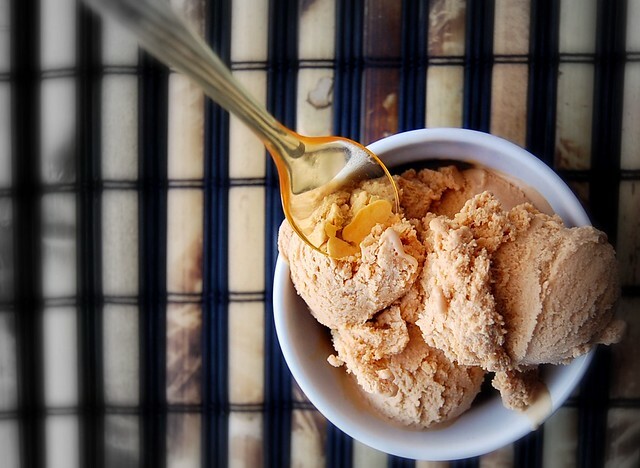 you really need to try david lebovitz's salted caramel ice cream. IT IS THE BEST! I fell love with caramel ice cream when I was in San Francisco last fall. I have tried making it a few times now, but each recipe I have tried has not set up very well. Most recently I made Thomas Keller's from Ad-Hoc. It had the best flavor of all the ones I have tried, but still a little soft in texture. One thing I notice in recipe that is different from all the others is that you add the caramel at the end of the cooking process. Yours looks much more solid in consistency than all the ones I have tried so far. I will have to try your technique on the next batch. I cannot wait to try this. Words cannot describe how I feel about caramel ice cream! Thanks for sharing! This ice cream looks amazing. I'd love to get an ice cream maker but I have so many other kitchen appliances I plan to buy first. For now, I'll just drool over your pictures. Yum! Yum! I can't believe I have two ice cream makers and have them put away for the winter. They are still right within reach though! I want this. Some questions on the recipe (that I want to make but am too lazy to go to the store) -- Would half and half work instead of heavy cream? How about skim milk instead of whole milk? Thanks! Looks delicious! ok, girl. I just made this. I mean, it isn't icecream yet, but I could just drink the custard stuff the way it is. Holy moly! I didn't really believe it would really taste like caramel. BUT IT DOES! Also, when I added the cream to the sugar it seized up and the sugar got all hard and weird, but I kept whisking, whisking and it all melted back in. EXCELLENT. I am going to serve this with Crack Pie. You know about Crack Pie, don't you (recipe is at Bon Appetit.com). Many thanks! Love your recipes! Ever since I had salted caramel ice cream at Molly Moon's ice cream shop in Seattle I have been OBSESSED. I got an ice cream maker for Christmas (the same one as yours) and I am making this as soon as possible!! I love salted caramel ice and made David Lebovitz's last summer. It was delicious! Hazel, no I don't think there is enough salt in it. Anon, I looked at that recipe. I bet it would be better because it has praline in it. Nicole, please let me know how it goes. JenBK, I'm glad it worked out for you! I hope you like it. Taylor, I want to go to Molly Moon's ice cream! would love to try this flavor! Oh that looks so good! I've never had salted caramel ice cream before and now I'm curious how it tastes. My husband loves ice cream and love to make it! I'm glad your loving your new ice cream maker! It's too chilly for me to start using mine again, but I'll definitely look to your blog for some recipes to try. I love making caramel now that I can actually do it. The flavor sounds really good. I'm in love with salted sweets! aside from a certain batch of cinnamon ice cream i had one time (which, i fear, will never, ever be topped), this may be the finest batch of the cold stuff i've ever seen. well done! 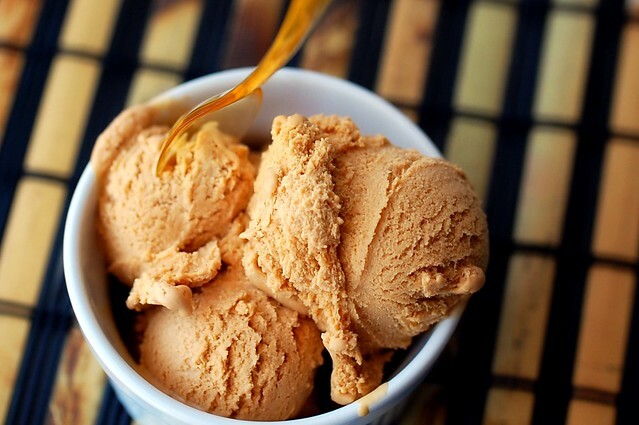 Caramel ice cream is the best. So glad you got a new ice cream maker! I'm anxiously waiting for more ice cream now. I hate recipe dry spells. I do get them, but I usually come up wtih something new eventually. I definitely need to get an ice cream maker! My ice cream maker is one of my fav kitchen gadgets and I think this ice cream is the next confection that needs to come out of it. It looks DELICIOUS. I actually got to try this at a place called Morelli's in Atlanta this weekend. I can't imagine that theirs could be much different than yours. It was fantastic. I strongly encourage anyone who reads this to try this recipe! You will not be disappointed. I am going to try to make it myself at home too. It's incredible. that sounds amazing!! and I love the rich color! Girl, you leave me speechless! I love salted caramels, so I know I want it in ice cream form! 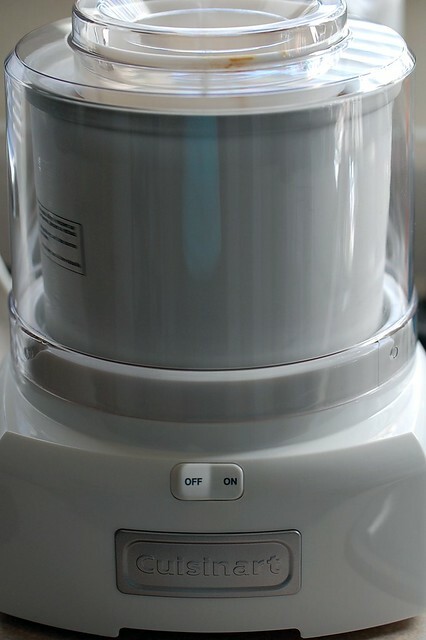 I realllly want a cuisinart ice cream maker, glad to hear good reviews of it. First i just wanted to say that i am a huge fam of salted caramel.. yummmm - i think my mouth was watering when i first read this recipe. Please tell me what i did wrong!! Hi Rachel! 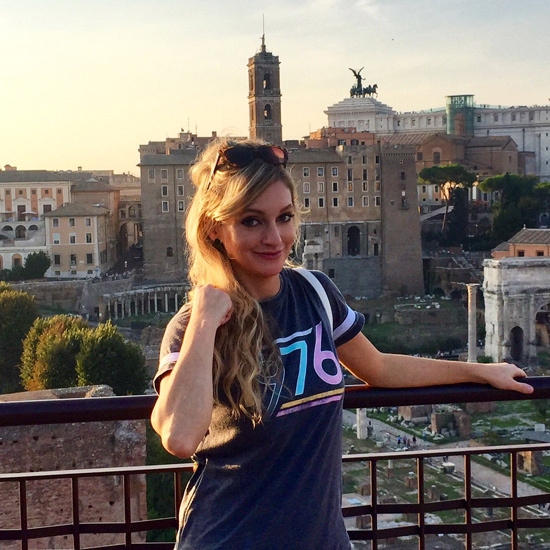 Thank you so much for reading my blog! I really appreciate it. I didn't have the white blog thing happen to me. If I had to guess, I would say maybe the milk/cream was cooked too long and curdled? Maybe the white blobs are cooked egg? I would strain the mixture to get the blobs out. Or they might just dissolve into the ice cream when you put it in the machine. I'm not sure.